Earlier today I posted about a current crisis of censorship on Facebook. What’s the deal? Well, there are two possible explanations, and they are both troubling, albeit in different ways. The first explanation is the good old-fashioned corruption of shadowy censors within Facebook. Very straightforward. Someone at Facebook is a fan of austerity measures and doesn’t like movements like J30Strike; she adds it to their spam system as a pretext, with the intent to keep individuals from learning about the site. This scenario, while admittedly conspiratorial, is somewhat more plausible than you may think. Peter Thiel, one of the executives known to guide Facebook in many ways, is a well-known ultra-libertarian who, I think it’s safe to say, support austerity measures. And, as I mentioned in my previous post, Zuckerberg and David Cameron were last seen chumming around via videochat, talking about ways to solicit cuts from the Facebooking public. But I actually don’t think that’s what happened here. Or at least, I’m willing to believe that there is another explanation, despite the shady pattern of blocking and unblocking that occurred this afternoon. And it’s not because I put it past Facebook to do something this scummy – lord knows I’ve called them worse before. No – there is a second explanation that is both more benign and believable in its cause and just as terrible in its consequences. See, I think it is more likely than not that Facebook was on the level. No grand conspiracy involving cryptocorporate machinations. Sure, maybe a few ticked-off Tories hit the “Report” button on J30Strike with the intent to get it kicked. But the censorship itself was all the product of automated technology. The initial site gets reported and kicked. Facebook has smart technology to sniff redirects to their destination and then block them as well. And since the metagraf pulled automatically from the text by the Facebook Share functionality included, in the grey text, the forbidden URL, my site got banned too. I think this is probably what happened. And while it may seem acceptable, it troubles me all the more. We often conflate intent with outcome. The intuitive argument goes something like this: if Facebook didn’t intend to commit censorship – if this was all just a set of dominoes toppled by a few disingenuous reports – then it can’t be criticized for the automated authoritarianism that occurs. Call me a consequentialist, but I’m not OK with that. Facebook is increasingly the space within which people receive their information, including civic information. Shared newspaper links, blog posts, and conversations in the comments may not intuitively accrue as much respect as the Federalist Papers, but they are at least as important in the public discourse as the proverbial crier on the common was generations ago. But where once there was a town common, there is now a walled garden, and the architecture of this enclosure threatens to throttle the pamphleteer before he so much as primes his printing press. Assume the best of intentions on the part of Facebook for a moment. Look at what still happened. A site advocating citizen activism vanishes from the face of Facebook. Then, alternate routes – the redirects – are shut down. After crushing the conversation, Facebook then successfully silenced the metaconversation – that is, posts like mine, commenting on the controversy, which merely linked to the content. Users had to resort to guerilla tactics – coded, deceptive transformations of the domain name – in order to spread the word slowly amongst the community. Think about that for a moment. Think about the incredible, suffocating centralized power the Facebook filter represents to controversial opinions. Had this been in a traditionally public forum, banning truly offensive or abusive material would have had to survive the strict scrutiny of a skeptical judge. But on Facebook – merely a mediated public – presumably a few reports were enough to simply disappear (used as verb; gulag connotations intended) an entire movement. And it only came back because enough people – again, including at least one journalist who called Facebook to investigate – knew about it already. 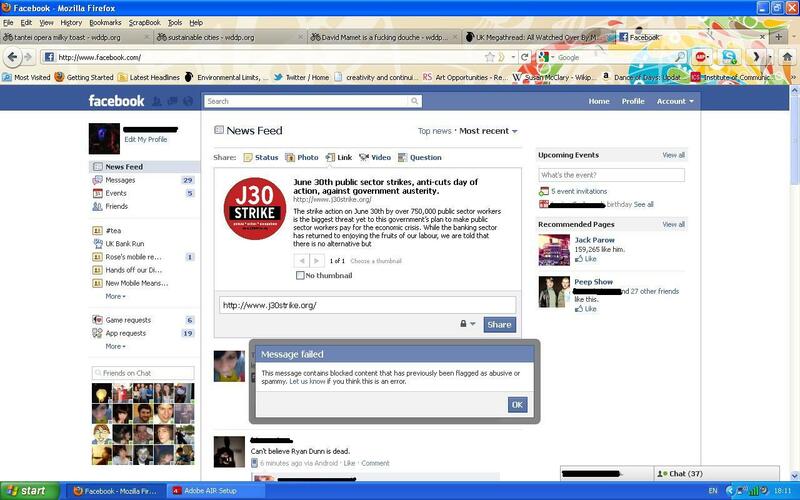 Had those avenues not been open, J30Strike on Facebook would have simply succumbed to a kind of automated crib death. That scares the living hell out of me – just as much as a conservative cabal at the helm of a conspiracy. We need to find out what happened here. We need to know how it was that a nonviolent, democratic demonstration was denied entry into the civic conversation. 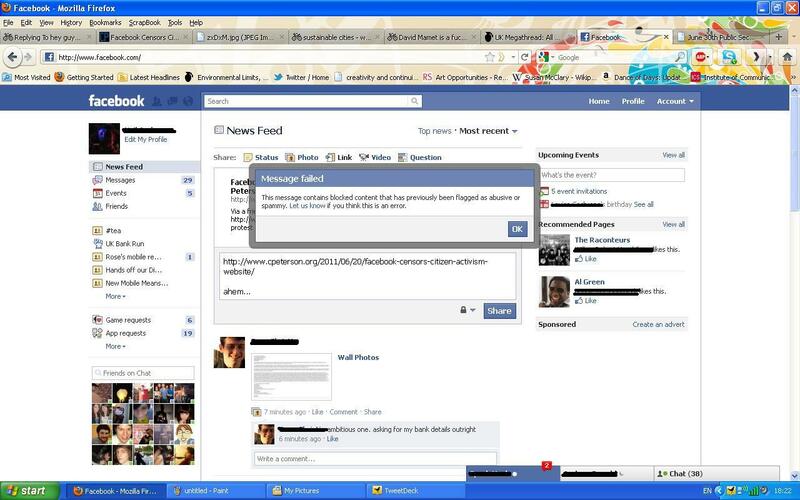 And we need Facebook to eradicate this Terminator style automated censorship from its architecture. If the protests in the Middle East taught us anything, it is that these digital spaces can facilitate real action. In this Facebook cannot be Janus-faced, humbly accepting accolades for its role in toppling tyrants while simultaneously silencing citizens at home. We’re far past the point where Facebook may acceptably discount or defer its moral responsibilities. We’re far past the point where they may plausibly claim to be a simple amoral actor in the social space. They are, by virtue of their own incredible success, co-consuls (with Google) of the world’s greatest information empire. We deserve, and must demand, their greatest care when it comes to matters of civic expression. Because the freedom of speech is too important to be merely automated out of existence. also released at that time. October had a variety of release arising. anchoring that occurred, and our continued focus on improvement. No must seek for local hookah stores once you’ve obtained ! For positive, I’ll strive your inexperienced tea latte too! that, in an period of shrinking audiences and declining ratings, its big scores dwarf almost every part round it. websites reminiscent of Hulu provide the most recent episodes of many well-liked TELEVISION exhibits. the Nation Bear Jamboree referred to as, Country Bear Christmas. cada uno de los recursos del móvil, como el GPS, el acelerómetro, la brújula, la cámara, consiguiendo aplicaciones con una enorme calidad y una experiencia de usuario completa.